Merges Facebook data with contacts in your Address Book. Is there a better alternative to FBContacts? Is FBContacts really the best app in Internet Utilities category? Will FBContacts work good on macOS 10.13.4? FBContacts is an application that loads your Facebook friends' data and matches them with the contacts that you already have in your Address Book. When the contacts are matched you will be able to import data from Facebook friends' pages, such as their profile image, name, work info(job title, company, ...), birthday and lots more. FBContacts needs a review. Be the first to review this app and get the discussion started! FBContacts needs a rating. Be the first to rate this app and get the discussion started! 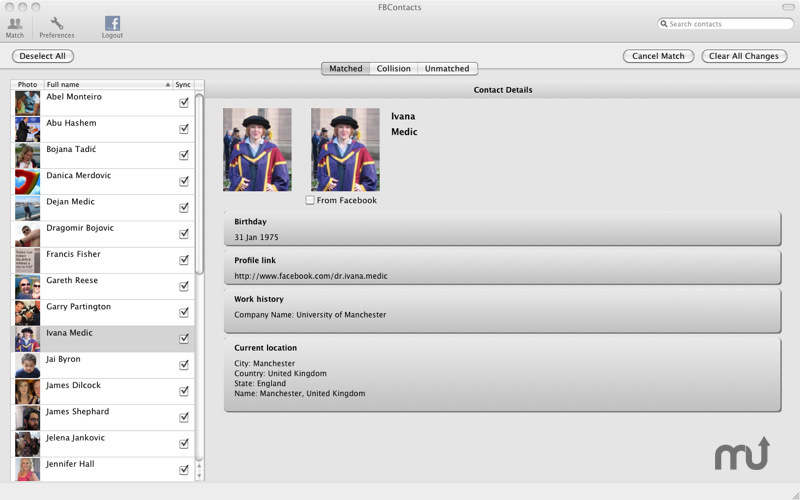 Before our application performs the synchronization of your contacts with Facebook, it will show a report organized in three sections, which represents the result of the contacts matching process.These sections are: Matched, Collision and Unmatched.In these sections you can include or exclude additional contacts from the syncing process and also link or import contacts for which the application did not find a match.